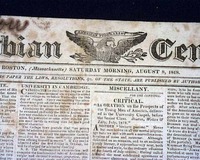 COLUMBIAN CENTINEL, Boston, Aug. 8, 1818. 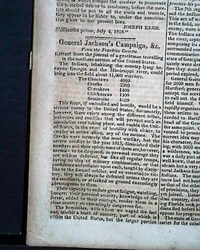 NILES' WEEKLY REGISTER, Baltimore, Aug. 8, 1818 Page 6 has: "General Jackson's Campaign" which lists the number of: "...The Indians inhabiting the country lying between Georgia & the Mississippi river..." totaling 11,000 warriors. It notes: "This force, if embodied and hostile, would e serious enemy to the United States...".